RICHMOND, VA— GPM Investments, LLC announces their $12,443 donation to Make-A-Wish Greater Virginia, a nonprofit that grants the wishes of children diagnosed with life-threatening medical conditions throughout Virginia. 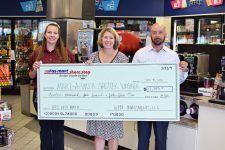 The donation is a result of a two-week campaign of collecting customer donations during checkout at 150 Fas Mart®, Shore Stop® and Scotchman® stores throughout Virginia. According to Lambert, wish kids are more willing to comply with difficult, but vital treatment regimens, and parents and medical professions alike often describe the wish experience as a turning point in wish kids’ battles for health. Make-A-Wish Greater Virginia has set the goal of granting 182 wishes this fiscal year, and has granted more than 4,500 wishes for Virginia children since the organization’s inception in 1987. GPM Investments, LLC, together with its subsidiaries, is one of the largest privately-owned companies in the convenience store channel of business. GPM has widened its reach to over 800 stores in a total of 17 states. The company, based in Richmond, VA, operates or supplies fuel to stores in Connecticut, Delaware, Illinois, Indiana, Iowa, Kentucky, Maryland, Michigan, Nebraska, New Jersey, North Carolina, Ohio, Pennsylvania, Rhode Island, South Carolina, Tennessee and Virginia. Their convenience stores have a wide array of food offerings, a house blend of coffee, fountain and packaged beverages, a large selection of groceries, tobacco, alcohol, and personal care products. Visit www.gpminvestments.com to learn more about their stores. Make-A-Wish® Greater Virginia grants the wishes of children with life-threatening medical conditions to enrich the human experience with hope, strength and joy. According to a 2011 U.S. study of wish impact, most health professionals surveyed believe a wish-come-true has positive impacts on the health of children. Kids say wishes give them renewed strength to fight their illness, and their parents say these experiences help strengthen the entire family. Headquartered in Richmond, Make-A-Wish Greater Virginia has granted more than 4,500 wishes since 1987 through the support of generous donors and volunteers. Visit Make-A-Wish at www.va.wish.org to learn more or call (804) 217-WISH.